Ugh! These last few prompts have made me grumpy, especially this one. Blueberries are the obvious choice, but nobody’s going to want to post about them, and we’re all going to try to come up with something super unique. SIGH. Well, I guess I’m no different, because I didn’t want to share a blueberry recipe either! When I think about the color blue in the context of my kitchen, I immediately think of Pyrex. I’m a lover of vintage Pyrex in general, but my two favorite pieces just happen to be blue! 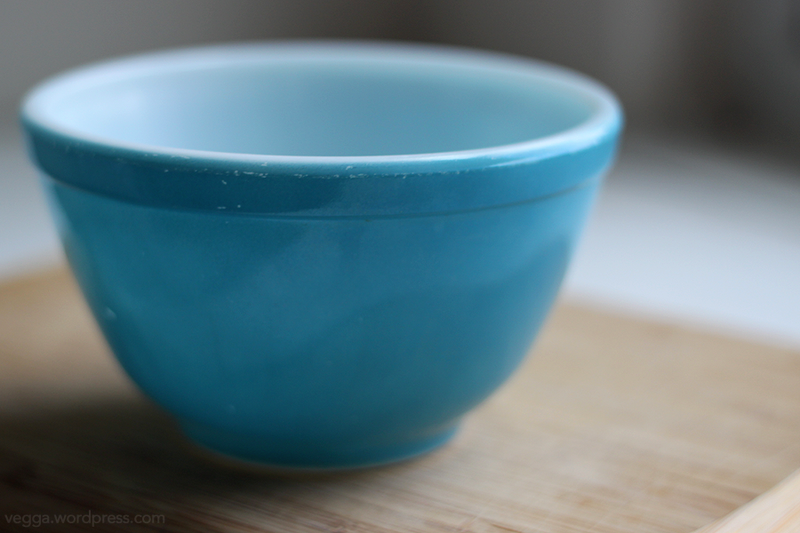 The first is this absolutely beautiful turquoise butterprint mixing bowl. Butterprint is my favorite pattern, and that turquoise is such a sweet shade! I’ve seriously considered getting that butterprint rooster as a tattoo. Not sure if I’d do it in turquoise, though. My second-favorite piece of Pyrex is this simple blue bowl, the smallest of the four pieces in the primary color mixing bowl set. I guess I’m a sucker for blue, because this shade just melts my heart! It’s so warm and peaceful. And I love how the blue fades into that beautiful almost translucent milk glass. This is my favorite bowl to use for snacks or noodles or, well, anything! I’m 100% in favor of using my Pyrex regularly, not letting it languish on the shelf. In fact, I keep my Pyrex bowls on display, but there are usually a couple of bowls missing because they’re in the drying rack! 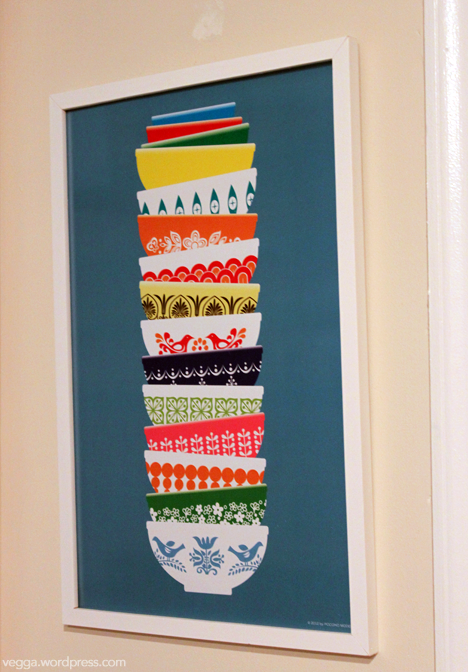 Finally, this Pyrex-inspired print from Pocono Modern is my favorite piece of kitchen art. And it just happens to have a blue background! The art work is happy and nostalgic, two of my favorite feelings.! yay for blue and yay for vintage pyrex! 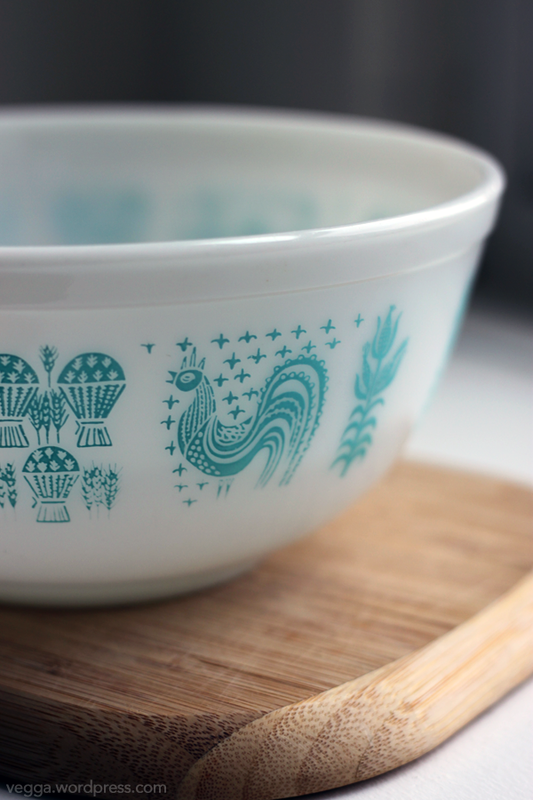 I have a set of two nice nesting casseroles with the turquoise rooster pattern, and I have the little blue bowl too!! I love pyrex sooo much. I love that you admitted that this prompt made you grumpy. I think some of them are really hard. There are a few that are making me grumpy too. Some of them are surprisingly hard! But overall, I’m really enjoying this year and the prompts in general. Yes! Get that rooster tattoo! Sky blue pyrex is lovely, I’d use it for everything too. I think it’s pretty high up on my body art list! Great interpretation of the blue prompt. I really love the print. I’ve got a little kitchen art collection with a food and text theme.